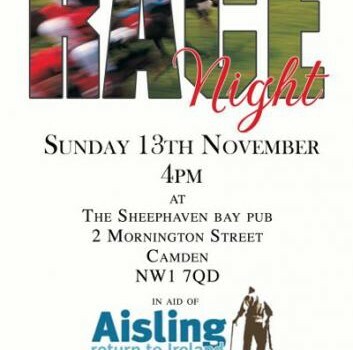 Aisling Return to Ireland would like to invite you to the Sheephaven Bay Pub, 2, Mornington Street, NW1 7QD for a Night at the Races on Tuesday 5th October at 7.30 p.m. Your support will be greatly appreciated either by sponsoring a race £50, naming a horse £10 (with a chance to win a bottle of champagne) and coming along on the night. All our holidays are funded by donations and therefore we have to continually raise funds in order to continue our work.